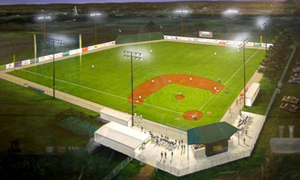 An artist’s rendering of Paris Junior College’s Hub Hollis Field, home of the PJC Dragons baseball team. The Dragons compete at the beautiful Barney Bray Athletic Complex - “Hub” Hollis Field. H.L. “Hub” Hollis was PJC’s first Athletic Director and Head Football Coach in 1925. He was inducted into the Dragon Hall of Fame in 1990, and the Dragons are honored that the baseball complex bears his name. Beginning in 1992, PJC began to combine efforts with local businessman Barney Bray in remodeling the existing facility. Mr. Bray’s gifts, along with those of many other local contributors, aided in the creation and remodeling of the Dragons’ current facility. After a half-million dollars in renovations and improvements, “Hub” Hollis Field is one of the premiere facilities in the TEAC. The seating capacity is 1,000, with field dimensions of 330 feet down the lines, 370 feet in the power alleys, and 390 feet dead center. The playing surface is tiff bermuda, which was sodded in the summer of 1998. We encourage you to come and experience the tradition of Paris Junior College.